According to some knowledgeable opinions, the Minix Neo G4 is a quality, second generation dual core based Android Mini PC. this recently introduced Mini PC has already been praised for it’s low heat output and consistent fast performance, ease of rooting procedure and elegant hardware design which includes bluetooth connectivity, something rather scarce to find on the Android Mini PC scape. The hardware specs of the Minix Neo G4 are the ones we’ve come to expect from a Rockchip RK3066 processor based Android Mini PC. Accompanied by a Quad Core Mali 400 graphics processor, the Dual Cortex A9 type processor is capable of 1080p video and even Flash hardware assisted decoding by it’s exclusive FTR technology. On the memory side we got 1gb of DDR3 RAM for our running apps and games, coupled with 8gb of FLASH RAM for storage purposes. Connectivity is present in wireless mode by 802.11b/g/n WIFI capability and Bluetooth. The Minix Neo G4 also includes an HDMI video output port accepting HDMI v1.4a enabling 3D movie file format support. It is also compatible with all audio and video formats we come to expect (pretty much “everything”). As I/O options, the Minix Neo G4 comes with one USB 2.0 port and a Micro USB OTG port, an IR receiver and a TF card reader supporting SD 3.0 up to 32Gb capacity). 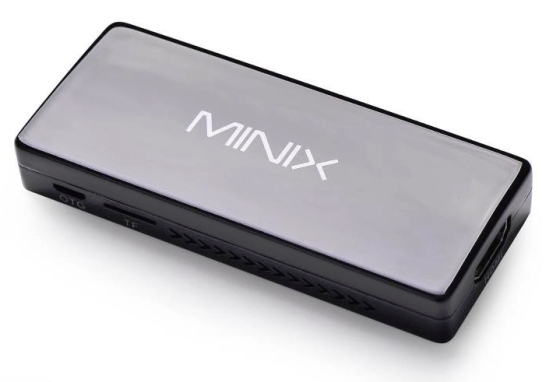 The Minix Neo G4 needs an (included) AC adapter which provides 5V 3A power, but the Android Mini PC itself uses less than 1A to operate. Android Mini PC: The Heat is On! Are you sure the NEO G4 has bluetooth support? I don’t believe that is correct but I am not positive. My understanding is that early in the pre-release, a spec was released that showed in had bluetooth but that was an error which has caused some on-going confusion. I would love to know if it can support bluetooth via an attached USB dongle. My wife wants our TV to work like the one in the movie, “Frank and Robot.” Deal with phone calls, Skype video, full internet connectivity, and still be a full blown TV. Send me an e-mail if you have a solution – TV takes four HDMI connections, so that’s not a problem.